Many of us have suffered sleepless nights at some point in our lives, and we are all well aware of how it can affect our daily tasks. A poor night’s sleep can make you lethargic, unproductive, unfocused, and can overall limit our ability to have fulfilling and fruitful day—and the effects of one bad night can last for weeks. Thankfully, if you find yourself not getting the rest you need, yoga can be beneficial in helping you establish a sleep schedule and get the restful sleep that your body and mind so desperately need to function at your fullest potential. A consistent, daily practice elicits the best results, but even practicing certain yoga techniques on restless nights can be beneficial for the less regular yogi. Here are some of the incredible ways yoga can help you sleep. It’s no secret that one of the main benefits of yoga is that it reduces stress. By hitting the mat on a consistent basis—ideally each day—you are helping to combat the stressors that might be causing chaos in your mind and keeping you awake at night. Studies have shown that yoga helps to reduce levels of cortisol, otherwise known as the stress hormone. By lowering your cortisol levels, you can work through the symptoms of stress and better prepare yourself for a restful night’s sleep. Studies have also shown that yoga can reduce the symptoms of those suffering from insomnia. In one study, patients who were dealing with insomnia were trained in the basics of yoga. They were then instructed to take what they learned in their training and practice every single day for eight weeks. After the eight weeks, researchers found that the practice helped patients reduce the amount of time it took to fall asleep, reduce the number of times they woke up in the night, and increase the total amount of time they slept each night—showing that a daily practice can have a huge impact on your sleep schedule. Your central nervous system consists of the spinal cord and brain. It is responsible for responding to certain sensory stimulation, and as we are falling asleep, the central nervous system switches into a different mode where our hormone levels in the brain change. Sometimes, as we are falling asleep, these hormone levels can still be elevated, and can make it difficult to actually fall asleep—even if we feel physically exhausted. 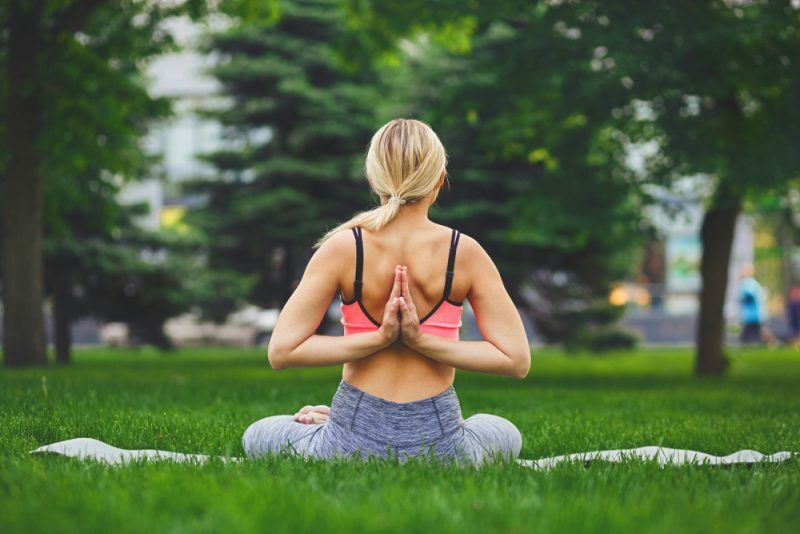 Yoga comes into play by increasing blood flow to the brain and helping with the release of the hormones that are necessary for us to fall asleep. It activates the parasympathetic nervous system, responsible for rest and digest, and allows for a more restful sleep. When we are feeling pain anywhere in our body, it can be hard to find a restful position to fall asleep, and when the pain is severe enough, it can make it nearly impossible to get a good night’s rest. Yoga can help you work through physical discomfort in your body, like chronic back pain or sore muscles. By using yoga as a natural pain reliever, you can count on getting a much better night’s sleep. People who are suffering from sleeplessness due to illness or disease may find relief with yoga. In a study at the University of Washington, researchers observed 13 women who suffered from osteoarthritis, which can cause sleep disturbances. The women completed an eight week yoga program, which included a weekly 75 minute class and a 20 minute home practice every night. Researchers found that the nightly yoga practice was a beneficial treatment for the sleeplessness symptoms caused by osteoarthritis. Going to bed angry is a guaranteed way to get a poor night’s rest. Rather than resting peacefully, your mind will be racing with thoughts that will keep you from falling asleep. When you don’t know how to deal with conflict, you will only find yourself in a harmful pattern of disrupting your sleep. Yoga is an excellent tool for working through conflicts both big and small in your life, and helps you approach life in a more mindful manner. By using mindful techniques to work through the issues of your life, you’ll be able to go to bed in a far calmer state of mind. One of the most common instructions you will hear from a yoga teacher is to listen to your body and do what is best for you. In class, you are responsible for making sure each posture and movement performed is serving your physical body in the best possible way. Thankfully, as you continue your practice, you’ll find that these teachings can apply to your life outside of the studio. When your body is signaling to you that it is time to go to bed, you will hopefully be more in tune with those needs and treat your body with the care it needs—rather than staying up for another episode of your favorite Netflix show. In yoga classes, you’ll become familiar with pranayama, or yogic breathing techniques. These breathing practices help you focus on the present and connect inward. Specific pranayama practices can be used as tools for accessing certain emotions or needs, such as the need for more energy or the need to relax. You can use these targeted pranayama techniques off of the mat and use them as sleep aids before you go to bed. Surya/Chandra Bhedana Pranayama (or Left Nostril Breathing), for example, is useful, as it stimulates the parasympathetic nervous system to promote better sleep. One of the hardest skills to strengthen is the skill of quieting the mind, but yoga and meditation are probably the best practices to use to work on that skill. When practicing on your mat, you learn to be present in the room, and not worry about what is happening outside of the studio or in the future. These same principles can be used when you are falling asleep. As your head hits the pillow, you can quiet the mind from thoughts of tomorrow’s tasks or worries about what you didn’t get done today, and focus simply on relaxing deeply and getting the rest you need. It isn’t exactly easy to completely relax both the mind and body. There is always some thought lingering in the background that we want to give attention to, or a fidget in the physical body that we can’t seem to bring to stillness. Through savasana, or Corpse Pose, we learn how to let go of both our body and mind and surrender to the present moment—an extremely useful skill to hone in on as you are trying to fall asleep. This is yet another instance of quieting the chatter in your mind as you are going to sleep. In yoga, you are given the time to self-reflect and look inward. For those who don’t have the outlet to do this, they end up using their valuable sleep time to do some of this self-reflection. While looking inward is important, this ends up robbing you of your valuable sleep. Yoga offers the productive space to observe your inner thoughts, and lets you turn down those thoughts when you are trying to sleep. Many of us don’t have a real nighttime ritual. We might look at our phones, scroll through Instagram, get in an endless loop of video after video on YouTube, and so on. Besides the fact that the blue light emitted from our screens isn’t beneficial for getting a good night’s sleep, this routine doesn’t exactly wind us down before bed. By creating a nighttime routine centered around yoga, you can better prepare yourself each night to have a restful sleep. Creating this yoga ritual helps signal to your body that it is time to go to bed, and takes you away from the temptations of mindlessly checking into your phone or computer. Try practicing these poses, or any that feel right for your body, before you go to bed. Even if you only dedicate ten minutes to the practice, you will be in a much better physical and mental state to get a full night of restful sleep. Of course, yoga is known for creating an energy of peace and serenity. When you are fully in these states, you are in the ideal atmosphere for an amazing night’s sleep. Practice before bed to connect to your inner-calm, and see how you are far better prepared to peacefully drift asleep. Whether you are suffering from consistent insomnia or just have the occasional restless night, yoga is a wonderful practice to implement to help mitigate these issues. Even if you aren’t practicing daily, try doing some of the targeted yoga poses before you go to bed, or practice specific pranayama techniques, and see how it shifts the quality of your sleep.